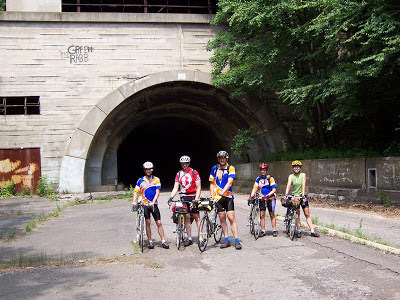 WCBC's Tour of Central PA, led by Wally Hertler, paid a visit to the Abandoned Turnpike in 2004. The Abandoned Pennsylvania Turnpike is a common name for the 13-mile section that was bypassed in 1968 when a modern stretch opened to ease traffic congestion in the tunnels. In this case, the Sideling Hill Tunnel and Rays Hill Tunnel were bypassed, as was one of the Turnpike's travel plazas. The bypass is located just east of the heavily congested Breezewood interchange for Interstate 70 (I-70) eastbound at what is now I-76 exit 161. 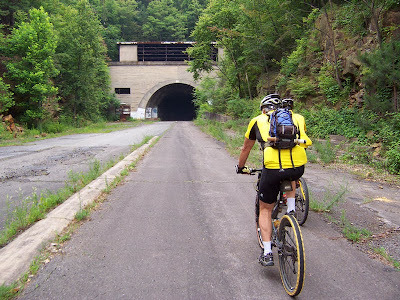 Visit the Abandoned PA Turnpike homepage for a wealth of information, including a history of the tunnels.